No matter if you are a small business or a large corporation, a primary objective is to reduce expenses and increase profits. Commercial window tinting can help you do just that. It can reduce energy costs, maintain a more comfortable and productive work environment, prevent interior fading, and improve exterior appearance. C-Thru Window Tinting offers a variety of commercial tint film, including security films, decorative window films, and vinyl wallpaper to elevate the look and feel of your office. Most companies strive to minimize their carbon footprint on the environment. C-Thru Window Tinting offers security and decorative 3M™ commercial tint films to help companies achieve this. Studies have shown that employee productivity is highest when the room temperature is between 70-73 degrees. 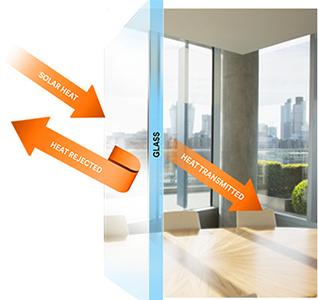 With proven heat-rejection properties, 3M™ commercial window films keep interior temperatures cooler and decreasing the need for air conditioning. Thus, your cooling system will operate more efficiently and inexpensively. Natural light can brighten up your office, but it can be harmful. In addition, the sun can create unwanted heat, which can affect your comfort. Our commercial window films reject up to 79% of solar energy, providing your employees and customers with a more comfortable environment. By reducing annoying glare, window films improve the visibility of computer screens as well as minimize eye strain. UV light and solar heat coming through windows can cause fading as well as damage to your merchandise, furniture, and carpeting. Window films reject solar heat and block over 99% of harmful UV light, protecting your valuable assets and furnishings from sun damage, so they last longer. Many business owners have a concept of what they want their office or workspace to look like, but they do not know where to start. C-Thru Window Tinting offers many interior decorating options such as decorative window films to give your commercial property the appearance you desire. Our films come in various patterns, colors, designs, as well as custom printed photos and images. The possibilities are endless! To further enhance your office or commercial property, C-Thru Window Tinting also offers custom vinyl wallpaper. You can choose from a variety of patterns, colors, and designs. Vinyl wallpaper is a great way to add some depth and texture in your room. Make the right decision to work with the tint pros at C-Thru Window Tinting. We are the tint shop with over 30 years of experience that has provided the Big Island with their tint solutions. We will provide you with excellent customer service as well as high-quality tint jobs at an affordable price.